The revision reason is: "This literally turns into history of /tg/ in the second half of this page + a lot of story is missing." 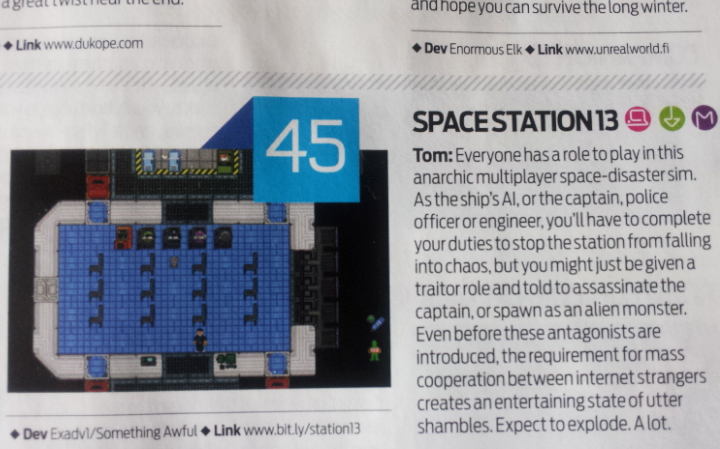 See List of remakes for a list of remake attempts and games inspired by Space Station 13. Here's a brief account of the history of Space Station 13. When the path branched, the path that leads to /tg/station is taken. Anyway, after its release in 2003, the first few years the game and game mechanics were kept in extreme secrecy. You could get banned for talking out of character about game mechanics or through other means, which are not in chracter. The original map (image needed) for Space Station 13 was updated through the years. Generally the map that pre-dates power and electricity generation is referred to as Originalstation, and all maps after that are referred to as OldStation. Rounds on Space Station 13 were similar to how they are now, eventually ending in the escape shuttle being called. Players numbers peaked at 10. Acquiring server files was difficult though, as you had to acquire them from one of the few people who had them. Never the less, SS13 servers started appearing on byond.com. The server files were sent as a compiled package (the .dmb and resource files only). It was also possible to acquire a version with defines, icon files and the map files. This version allowed you to edit the map, but you had to send the updated map file to someone with the original source, so they could compile it. After about three years, the popularity (yes, 10 players on a server was considered a popular game) of Space Station 13 started to drop. The few people with the original source files started to lose interest. A player known as AZA had received a compiled version of the game from Exadv1 but after some disagreements he was quite upset and proceeded to work with another player called hobnob to decompile this version and release it. This code was spread around from person to person until someone had the bright idea to start a community called OpenSS13. 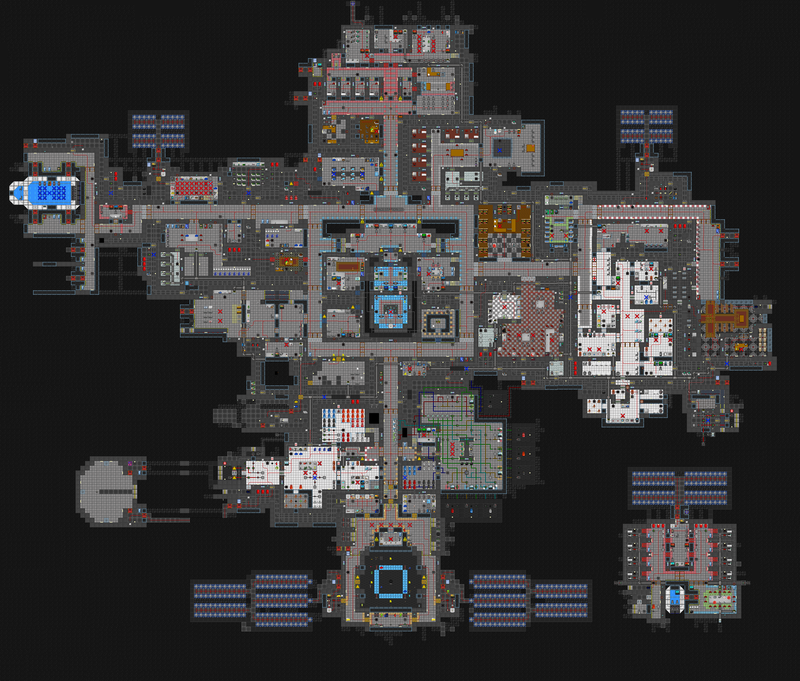 This was the first open-source version of Space Station 13. Around the same time, the Something Awful Goons began to notice the game and several goon-hosted servers appeared. In the era from 2007 to 2009, Space Station 13 gained a lot of popularity with communities like Penny Arcade, Goonstation and OpenSS13 starting to grow. Player numbers reached unbelievable peaks of 18 players! The map everyone played was still Oldstation. Each codebase however had its own, slightly edited version. OpenSS13 used the OpenSS13 Oldstation map, while goons used the Goon Oldstation map, the latter of which is now the Derelict. It was during this time that the Goonstation community revised the original SS13 backstory and produced what is now generally accepted as the proper backstory. In 2009, as Space Station 13 servers were getting up to 25 players at peak time, Goonstation coders and mappers made the biggest advance in years. They created a new, much larger station: Donut Station. As Goonstation was closed source, no other community could use the map, so they stuck with the OpenSS13 version. 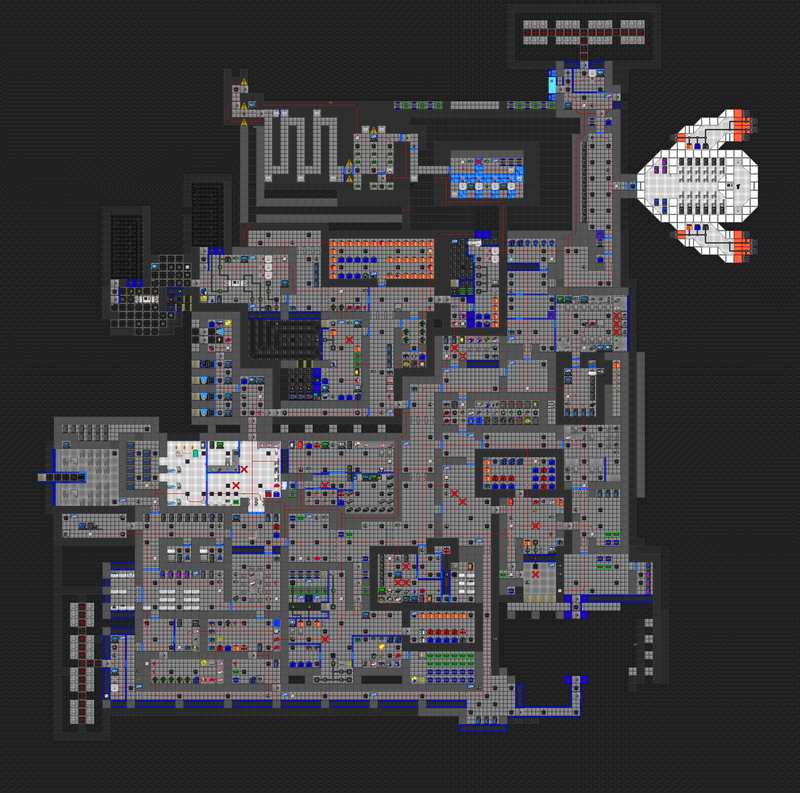 popularity of SS13 steadily increased through 2009, eventually leading to the creation of yet another map design in 2010, dubbed Uterus station. The release was accompanied by a rewrite of much of the old Space Station 13 code, much of which was still tainted by fallout from the reverse engineering from years before that. In April 2010, as player numbers on servers were hitting 50, Goonstation decided to release their source under the name Goonstation r4407. Until 2016, this was the latest version of the Goonstation code publicly available. After the release of r4407, the flood gates for new servers were open. 4chan spawned /tg/station, Bay12games spawned Baystation, both of which with their own set of coders, spriters and code, based on r4407 of Goon code. The three stations slowly gained player numbers. Goonstation with two servers, /tg/station and Baystation with one server each. The three communities each had their own policies and expectations for players, covering the full spectrum of roleplay. As player numbers continued to grow, additional communities sprung up: NoX Station, Facepunch, YogStation, /vg/station and others. In May 2013, the first transition of website hosting happened in a fairly bad way. The /tg/station forums and wiki were locked with little warning, forcing a scramble to create a new community web site. A large community effort succeeded in the transition of all /tg/station forum and wiki content onto a new site. Unfortunately, however, the old site remained online with no links to the new location. It very quickly fell into disrepair, making visitors think /tg/station was abandoned. Because of this, it took months for /tg/station to return to its former player count. The new site was only destined to last a year. The explosive growth of /tg/station during this time in both player numbers, administrative team size and developer numbers, as well as the first instances of a "new guard" / "old guard" split, caused tensions in all three groups. Around Easter 2014 this culminated in a series of events, including the creation of a short-lived branch called NT-Station, the forceful removal of head administrators, the forceful removal of head coders and the web host dropping support for the developer community. The turmoil resulted in the creation of a new web site for /tg/station and the conclusion of the first transition of power in the administrative and developer ranks. 2015 and 2016 saw fresh challenges and changes for tg. The original server host stepped down from hosting the game server hosting, a new host stepped up and the server became crowdfunded through the community. A second transfer of server hosting went through with very little fanfare a few months after. Player numbers began to push 85+ players per server, the stations are huge and the game saw an explosion of contributions on github from many new developers, as well as some media attention from gaming magazines. And then on March 1st of 2016 someone stole the gooncode and publically released it - after some deliberation and messages of support from the other codebases, goon decided to make a new public release of their codebase instead of leaving it in a semi legal grey area. A third server branch of /tg/ was created, using goons code to branch off from the main arm. This went as well as you can expect, the server never picked up a viable player population after the initial honeymoon period, and the server was eventually shut off. Ion was cancelled and stationeers was announced instead as another ss13 inspired game. It has currently come out in Early Access. This page was last modified on 4 October 2018, at 20:44.